This is our latest prayer card. We would love for you to pray for us, so feel free to print it off and put it on your refrigerator or near your desk. Bradley and Annie Balfour are new missionaries to TBM. On their way to their new ministry and new home in Las Vegas, they stopped by the home office for a brief stay. They and their four children moved from New Jersey. 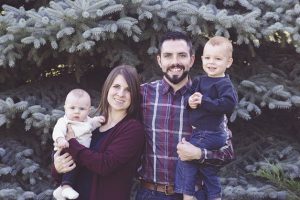 Pray for the Balfours as they begin connecting with their partners in the TBM church plant in Las Vegas. Another new couple, Victor and Maddy Ramirez from Spain, have also recently stayed with us in La Grange as they raise support before going back to their ministry. 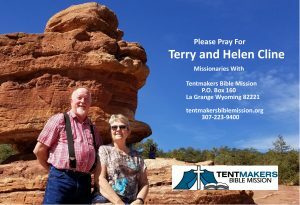 Please pray for them while they are travelling and raising support for their ministry. For several years, the TBM home office has hosted the missionary men from the FSB missionary conference. Since it was such a large conference, and the time was intense, we decided not to have any agenda and just let the men relax and visit. We had about 40 attending. The missionary ladies met in the home office for their time together as well. Many from the conference attended. This is just one of the many ministries of the home office. Ben and Chuck and I, with some other help, have done a lot of remodeling and maintenance with the home office building these last few months. One project was to revamp the Wall of Servants. We installed shiplap, replaced the paper map with a wood one, are redoing all of the pictures, and finally we combined all the pictures of both the missionaries and the board members to one wall. It takes a lot to maintain the premises, and the Lord has given us the background and Google to accomplish it. We also went to the Air Force Academy, Garden of the Gods, Woodland Park and Cripple Creek. Praise the Lord for time to rest. For faithfully supporting us with your prayers and your gifts. We value your participation of love in the Gospel.